West Side School, West End Avenue, Middleborough, MA, cabinet card, 1890s. During the 1930s, a series of short informal histories of the various Middleborough school houses were compiled by J. Stearns Cushing, Superintendent of Middleborough Schools from 1927 until 1955. Mr. Cushing prepared these histories for publication as a series in the Middleboro Gazette beginning on February 24, 1933. With information culled largely from town reports, the series entitled "The History of Our Schools" sought to provide the community with a better understanding of the past history of its public school buildings. Much can be added to Cushing's history of the West Side School, including its closure and subsequent rehabilitation as a private home by William Fuller of Middleborough. For the moment, in addition to a few short background notes, Cushing's brief consideration of the only school ever to be located on the West Side will need to suffice. In the future, it is hoped that more on the school's history can be shared. Although not a part of Cushing's published history of the West Side School, the following notes were included with his manuscript and provide a timeline of the town's actions in building the school. April 1, 1893 Voted: that a schoolhouse be built on the west side of the Old Colony railroad and completed before the fall term. Also Voted: that the School Committee be authorized and instructed to procure plans, specifications, and estimates and have them ready at the adjourned town meeting. April 15, 1893. The chairman at the school committee meeting made a verbal report ad presented plans or the schoolhouse to be built on the west side of the railroad and presented the following proposition in regard to lot [upon which the school was ultimately built] from Eugene P. LeBaron. I propose to sell and convey to the town of Middleboo, for the sum of one dollar, a certain lot or parcel of land situated about 315 ft. south of Center Street, between West End Avenue and Warren Avenue, with a frontage on both avenues of 120 ft. and 250 ft. between avenues containing 30,0 square feet of land. The condition of the sale is, that said land is to be used for school or other town purposes and should said land be used for any other purpose than above specified then the said land shall revert back to me or my heirs. I would request that all surplus soil or gravel may be deposited on a lot belonging to me within 100 feet of said schoolhouse lot at the expense of the town or builder. Voted: that if the town accept the proposition of Eugene P. LeBaron to convey to the town a certain lot or parcel of land for a schoolhouse the School Committee be authorized to purchase for the town the two lots on the southerly side at an expense not exceeding $250 each. Voted: that the town accept the proposition of Eugene P. LeBaron. Voted: that the School Committee proceed to build, etc., at a cost not to exceed $6,500. Voted: $1,000 for heating and furnishing. At a special Town Meeting Dec. 9, 1893 Resolutions wee written into the record on the death of Mr. LeBaron. During the years just prior to 1894 there was a decided growth of population west of the railroad tracks and the station property. This growth necessitated the building of a schoolhouse to accommodate the pupils of that neighborhood. Accordingly the town voted to build a building, the same to be ready for occupancy in September 1894. "It is a wooden structure, two stories in height. Its exterior dimensions are 54 x 50 feet. It has four school rooms two on each floor, entirely across one side of the building, with a staircase and teacher's room at each end. It is heated by two furnaces, has a modern system of ventilation, and is well lighted. The rooms are furnished with adjustable desks and seats. It is well adapted for school purposes, and credit is due to the members of the building committee, Messers. George E. Wood and John C. Sullivan, for the manner in which the work was done an the good results obtained." "The building was dedicated, with appropriate exercises, Friday, October 19, at 2 o'clock P. M. The corridors and rooms were appropriately decorated with autumn foliage and the national colors. A large and enthusiastic audience was present, and many availed themselves of the opportunity to inspect the building at the close of the exercises. Hon. Frank A. Hill, Secretary of the State Board of Education, was the principal speaker." "Mr. Hill spoke at length, expressing at the outset his embarrassment in adapting his talk to his audience, since there were before him all stages of life from the cradle to the grave. He congratulated the town upon the completion and equipment of so commodious an edifice. The dedication of a public school building is a suitable event for the flaming up of an interest that ordinarily is quiet steady, and devoid of the sensational. The enthusiasm of this occasion will, of course, subside since no zeal can be kept at a white heat and endure, but the people's interest may be trusted to keep on in its old undemonstrative but effective way." The following Principals have served the school since its dedication. In 1920 there was a congregation of pupils in the Center and a two room portable building was erected at the rear of this building. The building was paid for by the Peirce Trustees and cost upward of $8,000. Although this building was intended to be a temporary structure it has now served thirteen years. (Following 1961, the West Side School was incorporated into the Northern Elementary School District which included the Pratt Free, Plymouth and Pleasant Street Schools, and later the Flora M. Clark School. Principals subsequent to this date served as principal of the entire district). During its early years, the West Side School developed a role of being a safety valve for the remaining central schools, taking in pupils from the overcrowded Union Street and School Street Schools. In 1901, crowding in the Main Street grammar school (housed in what was later known as the Bates School on South Main Street) prompted a decision to send all local seventh grade students to the West Side School where there was a vacant room, and to regrade the school. This move was made effective at the opening of the winter term, January 2, 1902. 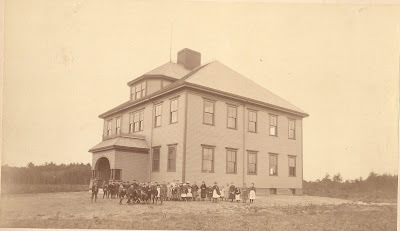 The West Side School, like the other large central schools, was expensive to maintain, and the 1901 School Committee report remarked that the school had demanded a large expenditure for heating and plumbing, and the following year because of heavy use over the previous nine years the school was deemed as being in need of "some renovation". The West Side School continued to absorb additional students from the center district schools. In the autumn of 1904, it took some of the fifth and sixth graders who had before attended the Union Street School in an effort to eliminate overcrowding there. That same year, the West Side was again noted as being in need of interior renovation. Because of the school's role in taking in pupils from the other central schools it, in time, became crowded itself, its enrollment increasing fifty percent in the few short years between 1901 and 1904. The School Committee report for 1905 noted: "The West Side school must be regraded to accommodate even the present membership .... This will nearly fill every seat in these rooms, leaving but little room for pupils to be transferred from the other Central schools. We cannot look to much relief to the West Side building for the overcrowded Central schools, as we have for the past four years." Three years later, the problem remained: "The membership at the West Side school is rapidly increasing and soon the building can only be used for primary and intermediate grades." Crowding continued throughout the latter period covered by Cushing's history, and as he notes, a two-room portable building was ultimately purchased and erected at the rear of the building. Initially intended as merely a stop gap measure, the portable building soon became permanent. It continued in use until 1938 when the new Union Street School was opened, at which time a hurricane fortuitously destroyed the portable building, thus "solving the problem of how to dispose of it." The increasing number of students during the next fifteen years, however, warranted the construction of a four-room addition to the school, which was opened March 30, 1953. The West Side School continued in use until closed in the 1991 centralization of the Middleborough schools. I love to see pictures and read stories about my hometown Middleborough, Massachusetts. By in 1975-76 during the Bicentennial I did ten sketches of my Town for the Bicentennial committee which were made into post cards by Winthrop Akins Company and sold at the Town Hall on Center Street. The sketches were later used by a group of women who made the squares for the town quilt. Keep up the great work! Ellen Rantz professionally known as E. Marie Francis now of Vero Beach, Florida. looking for class pictures from west side school 1970 1971 specificlly mrs revas 2nd grade class any pictures would be appreciated!! can emaail any info to douga34@excite.com thank you! I am acquainted with the family who bought this school and who use it as there personal residence. The tin ceilings are amazing. The former principle's office is now a bathroom.